(Colorado Springs, Colo.) – USA Fencing and the National Fencing Foundation will introduce military veterans and first responders to the sport of wheelchair fencing on Saturday, Feb. 2 at the Gaylord National Resort in National Harbor, Maryland. Held in conjunction with the Capitol Clash, the event will begin at 11:45 a.m. with a one-hour demo of wheelchair fencing beginning at noon. Those interested will also be able to try wheelchair fencing and learn about the different weapons. Ten members of Team USA who compete in wheelchair fencing will be in attendance, including five-time Paralympian and five-time Wheelchair World Championship medalist Curtis Lovejoy (College Park, Ga.) and Ellen Geddes (Johnston, S.C.), who ranks in the top 10 in both foil and épée in the IWAS Paralympic Qualification Rankings and is a top hopeful for the 2020 Paralympic Games. Mickey Zeljkovic (Huntingdon Valley, Pa.), the coach of the 2017 USA Fencing Wheelchair World Championship Team; Squad Manager Ginny Boydston (Jackson, Miss. ); Sports Performance Manager Brandon Dyett (Colorado Springs, Colo.) and Senior Director of Operations Christine Simmons (Colorado Springs, Colo.) will be at the event to answer questions. Following the event, those interested in wheelchair fencing are invited to a reception which includes a meet and greet with Team USA’s wheelchair fencers. 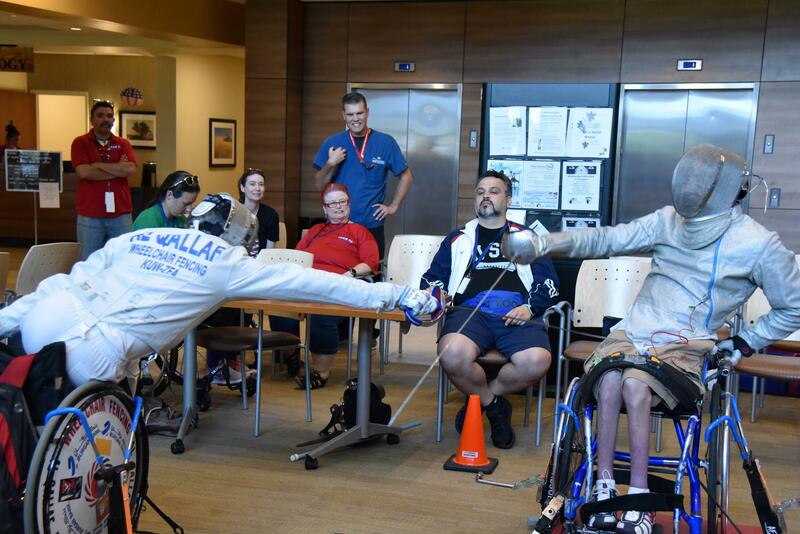 For military veterans and first responders interested in pursuing Paralympic dreams, the National Fencing Foundation is offering to pay for lessons for one year and the first year of a USA Fencing membership. Full room and board for national and international competitions is also a possibility through the Foundation. For more information about the event or wheelchair fencing, contact Dyett at b.dyett@usafencing.org.